For quantitative determination of fatty acid and evaluation of drug effects on its metabolism. Fatty acids are aliphatic monocarboxylic acids that are ubiquitously found in animal or vegetable fat, oil and wax. Fatty Acids play important roles in cellular synthesis, energy metabolism and are implicated in diverse disorders such as diabetes mellitus, sudden infant death syndrome and Reye Syndrome. BioAssay Systems’ method provides a simple, one-step and high-throughput assay for measuring free fatty acids. In this assay, free fatty acids are enzymatically converted to acyl-CoA and subsequently to H2O2. The resulting H2O2 reacts with a specific dye to form a pink colored product. 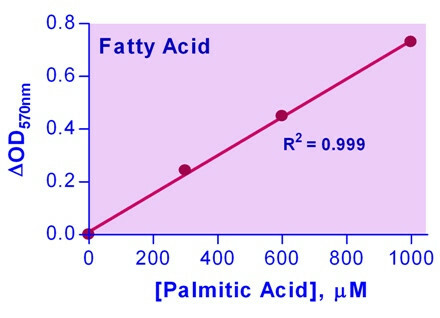 The optical density at 570nm or fluorescence intensity (530/585 nm) is directly proportional to the free fatty acid concentration in the sample. Applications For quantitative determination of fatty acid and evaluation of drug effects on its metabolism. 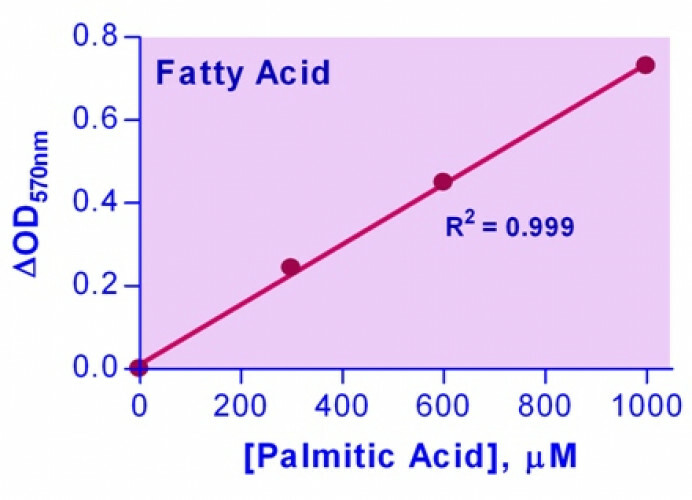 References Assay: Fatty Acid in Mouse Plasma (Pubmed).